Note: Items in green below are included directly from the calendar of the San Diego Chess Club. Beginning March 14, 2014, the San Diego Central Library at 330 Park Blvd. 92101 has weekly Friday Downtown Chess meet from 3-5 pm. We now meet from 1:30-5:30 every Friday. Tournaments every quarter with cash prizes. June 27, 2014 from 2-5:30, is San Diego Central Library’s Downtown Chess First Quarterly Blitz Tournament. Come one, come all! Downtown Chess will be closed this Friday, October 10 for Staff Development Day. Every Thursday at 2PM, the Point Loma Library Chess Club meets at the Point Loma branch library. It’s very informal; just show up and play. If you have a set and board bring it, as the library has a limited number of sets. Serra Mesa/Kearny Mesa Branch Library hosts a chess club every Friday from 4:00-5:00. North University Branch Library chess club located at 8820 Judicial Drive San Diego 92122 meets every Monday from 3-5:30 pm. Casual play and all skill levels are welcome. Mountain Lake Chess Camp holds a regular (usually monthly during the school year rated scholastic chess tournament. 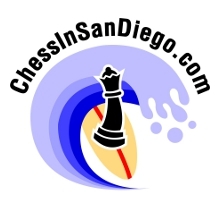 Our next one is at 12:30 on November 5 at the Pacific Bluffs Clubhouse at 5326 Mt Alifan Dr., San Diego, CA 92111.
any chess clubs on South bay area? San Diego, CA 92139, meets every 2nd and 4th Mondays of the month, from 2:30-5:30. Downtown Chess now meets from 1:30-5:30 at the same place, San Diego Central Library, 330 Park Blvd. San Diego 92101.